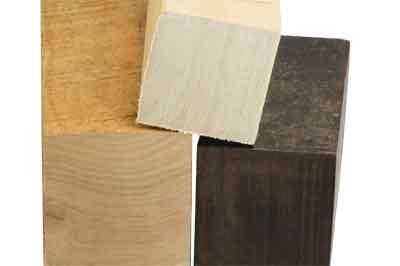 With all of the great woodturning equipment manufacturers, products are usually available to solve most workholding problems you'll face. Unless you are in a very specialised field, it's likely someone else has had need for a solution to a similar problem. That usually drives creation and sale of a product providing a solution. The more common the need, the more solutions competing in the marketplace. There are several possible situations for any workholding need. Common needs usually are addressed cost effectively which the marketplace will support. There sometimes isn't such a happy ending. On occasion, particularly with low volume demand or with a quirky problem, the product either isn't an effective solution or costs more than you are willing to pay. You're forced to live without a good solution and make do with what is available or you need to create your own solution. This month, we'll explore just a few areas where you can make a relatively low cost, home built solution. Whether to solve the unanswered problem, build a better mouse trap, or to save some money, we'll cover some tailstock creations in this article. Headstock creations will be explored in a future issue. While the fixtures are sufficiently illustrated for you to easily make, the more important takeaways are the design and build thought processes along with the alignment methodologies. Your first decision on any of these workholding aids is whether your creation is a 'quick and dirty', single or low use solution. For one time or limited use, you may be willing to fiddle with it to get things properly aligned and clamped. If you'll use it often in the future, are you willing to design and build your solution to be easily mounted with precision alignment built right in? This initial decision often drives the material selection and the care of construction. Depending on your skill sets and available equipment, the workshop handy turner can make just about anything. 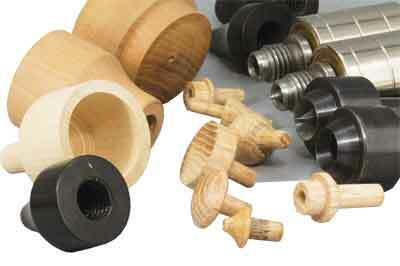 We'll cover only processes that you can do entirely on your lathe here. Our focus here will be simple and straightforward to emphasise the accuracy and positioning thought processes. Once understood, you'll have the ability to build on these concepts to further expand your workholding capabilities. The alignment accuracy and repeatability can be addressed in one of several ways. You can use the point of your tailstock centre to locate position and the push forward point for your fixture. This is usually the simplest solution. It is universal since it can be used anywhere by anyone with a pointed tailstock centre. A better solution is to use the point for positioning and the contact with the outer ring to be used for applying force. These methods have the down side of not being fastened to the tailstock centre and requires holding the fixture in place while positioning. 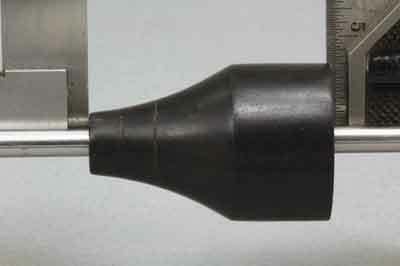 Several manufacturers' tailstock centres have outboard spindle threads. For those, you can thread your attachment in place and it now becomes part of the tailstock centre until you remove it. A bit more effort to make but certainly attractive from an ease of use perspective. For those owning tailstock centres without threads, an option available for positioning and/or attachment to the tailstock centre is using the taper created for the replaceable tailstock centre point. Knocking out this point allows you to use the lead in angle and centre hole to position and hold your fixture. The last simple option is to 'swallow' the entire tailstock centre outside diameter while still using the point for position and front face of the tailstock for the application of force. The slip over engagement of the fixture will hold it in position while you are orientating your blank and tailstock centre. There are many items we could use to illustrate homebuilt fixtures incorporating the positioning methods detailed above. Picking a couple as examples, let's make a ball holding tailstock centre attachment and a mandrel saver. 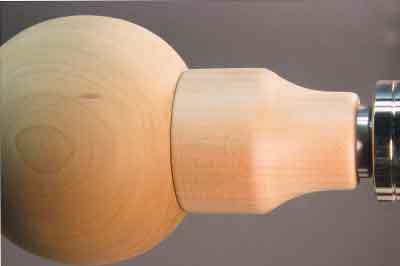 If you make spheres, eggs, bowls or other rounded objects, it is handy to have a way to position and hold the partially or finish turned rounded work without damage. If you are always going to make the same diameter, you can easily make the proper sized cup to cradle your part. You can turn it to fit a sample piece by trial and error or create a template. 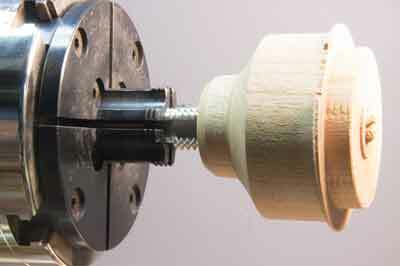 Should a sphere fixture for many diameters be needed, you can create a cup geometry that allow for contact between two different locating positions. Padding tape can be used to prevent marking for any of these. 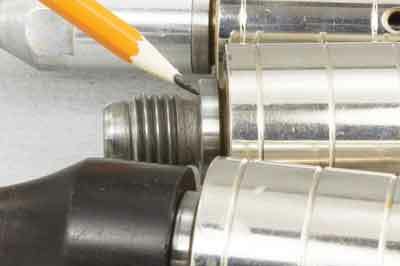 A mandrel saver, for the pen turners among us, is an extremely valuable tool. It allows the force from the tailstock centre to be applied directly to the wood or bushing and not the end of the mandrel. Applying the force directly on the bushing and allowing the mandrel shaft to slide freely inside the mandrel saver eliminates flexing or permanently bending the mandrel. Single purpose or multi-use fixture? Eliminating these common problems improves the quality of the turned pen parts and saves on repair or replacement of the mandrel shaft. Again, the mandrel saver can use any of the previously mentioned methods of alignment and attachment. There are mandrel savers available on the market but this tailstock creation is very easy to make and offers many advantages over the commercial versions I've seen. Besides being fun to make, it is extremely inexpensive to make from wood or plastic. If you want to be clever, you can make the mandrel saver nose diameter to be a bushing size so it can act as the backend bushing, too. You can cut right into it whether intentional or accidental. When tattered enough, you can make another or better yet, make a quantity of them when you are set up for your first one. An added bonus of the mandrel saver is that the diameter drilled for the clearance of the mandrel shaft - 6mm - is also a common shaft size for the sanding pads and many other shaft mounted accessories. Mounting the mandrel saver on your tailstock centre allows you to insert any of these pads, with or without the sandpaper, to be used as a push pad. 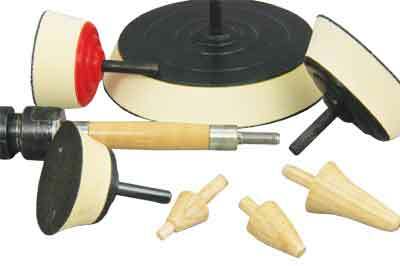 I'm certain you'll see the advantage of being able to use a soft pad to hold your turnings in place without damage. Whether you are sanding, applying finish, painting, or other form of after turning decoration, this soft compliant pad can be a valuable tool. You don't even need to use the sanding pad. I often use the mandrel saver alone with a couple of layers of tape over the end to ensure no scratches. 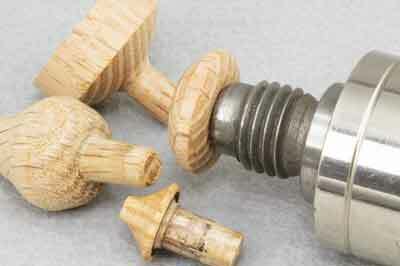 Another bonus is with proper shaping and length the nose taper is useful to support goblets, boxes, and other turnings. Whether you make a mandrel saver for pen use or only the added bonuses, you'll find it a very versatile tool. The concept is extremely important. 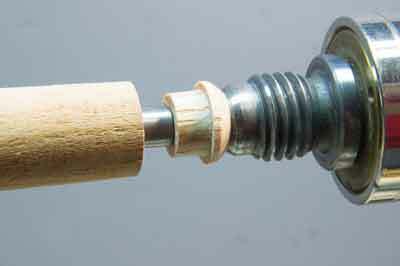 By creating this handy combination mandrel saver/adaptor, you'll have the beginning of a custom tailstock system. You have the start of a custom tailstock workholding system. Anything available or made by you with a 6mm diameter shaft will plug right in. Make this system with any diameter hole that suits your needs. In order for the tailstock workholding adaptors to be accurate, there are a couple of keys to be heeded during design and creation. These are simple but important if you want accuracy and repeatability. 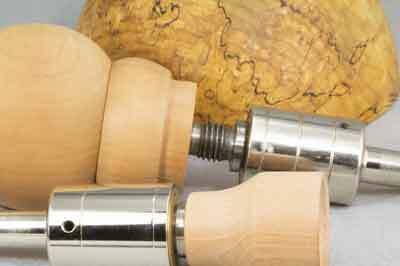 If you drill off lathe, you'll need to use those drillings for alignment during subsequent processing. Creating mating surfaces, drilling holes, and turning shapes need to be done with a single fixing if possible. Always accurate with respect to the axis of rotation of the lathe. 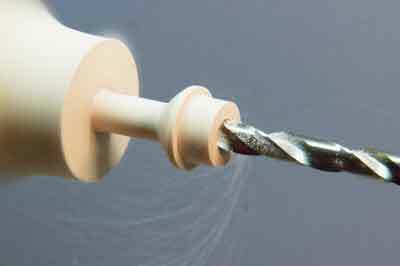 Drilled holes need to be used as mandrel positions for subsequent processing. Every time the fixture is reorientated for additional work it is prone to accumulating error. Proper planning and execution now will provide the best accuracy and repeatability later. This is where it is decided so take your time and do it with care. Perpendicularity and parallelism are the two features that will be used over and over again as your tailstock fixtures are being employed. The obvious question is, 'why bother?' Unhappiness with the commercial solutions available or pricing seem reason enough. You can custom tailor the solution to your specific needs and save some money as well. More importantly, the fundamentals of fastening and alignment involved in making these should help you become a better turner. Understanding the fixing accuracy, positioning and especially repositioning here, will help you understand how errors can creep in and destroy your positional accuracy in other workholding and fixing. If you are doing precision work, you canâ€™t allow your workholding methods to rob you of any bit of accuracy. Any bit you lose can degrade your final result. Use these concepts to not only build and expand this simple system but to help you ensure the best accuracy and repeatability in your future custom workholding endeavours.